Cuyahoga Falls News Press – April 15, 2018 – CUYAHOGA FALLS, OH — “We would not be here without the voters, who passed our bond issue in 2015,” said Superintendent Dr. Walter Davis. 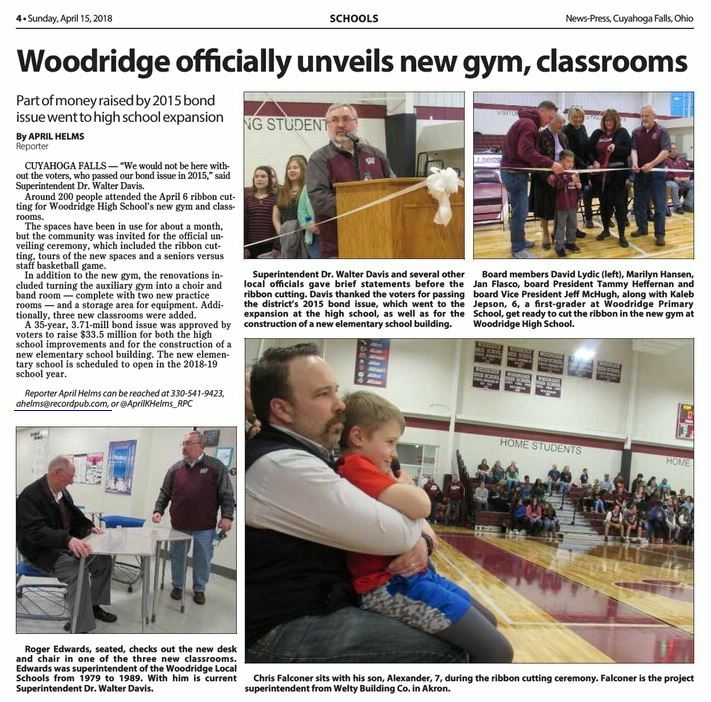 Around 200 people attended the April 6 ribbon cutting for Woodridge High School’s new gym and classrooms. The spaces have been in use for about a month, but the community was invited for the official unveiling ceremony, which included the ribbon cutting, tours of the new spaces and a seniors versus staff basketball game. In addition to the new gym, the renovations included turning the auxiliary gym into a choir and band room — complete with two new practice rooms — and a storage area for equipment. Additionally, three new classrooms were added. A 35-year, 3.71-mill bond issue was approved by voters to raise $33.5 million for both the high school improvements and for the construction of a new elementary school building. The new elementary school is scheduled to open in the 2018-19 school year.